Looking for cheap formal dresses or inexpensive semi-formal party dresses? If you’re on a budget and looking for a cheap dress that is as beautiful and elegant as the couture counterparts, shop this assortment of cheap cocktail dresses, formal gowns, and long evening dresses for under $100. Simply Dresses offers many discount formal dresses that are impressive and feature expensive-looking details to ensure an affluent-looking style for your next special occasion. 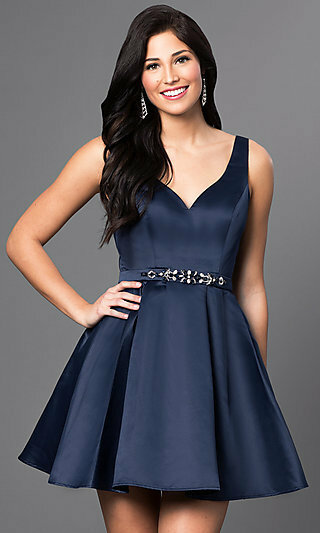 There are fabulous, affordable military ball gowns, cheap cocktail party dresses, as well as inexpensive dresses for bridal parties and wedding guests. No need to sacrifice fashion to meet your budget! The variety of available dresses for under $100 provides a wealth of options. From long evening dresses to short party dresses, this assortment of inexpensive dresses for under $100 features the latest styles and colors for this season. Where Can I Find a Stylish Trendy Dress Priced Under $100? Shop Simply Dresses’ assortment of affordable formal, wedding guest, cocktail, and casual party dresses to find contemporary dress styles for under $100. Discover discount formal dresses that feature all the season’s latest trends. There are cold-shoulder and off-the-shoulder long evening dresses accented with sparkling sequins, lustrous jewels, and finely detailed delicate lace and embroidery accents.These affordable formal evening gowns, cheap cocktail dresses, and discount party dresses are ideal for the savvy shopper who appreciates the finer styles, but also loves a bargain. It doesn’t matter if your personal style is classic and romantic, funky and edgy, or cute and flirty, you will find cheap party dresses and affordable women’s formal dresses ideal for highlighting your unique fashion sense at any upcoming special occasion. When it comes to choosing an ideal special-occasion dress in your budget, the array of choices available at Simply Dresses makes it a breeze. This assortment provides a wide variety of colors, fabrics, styles, designs, and features from which to choose. Here you will find unique and affordable two-piece prom dresses, vibrant print formal dresses, and even cheap cocktail dresses with pockets for convenience and storing all the cash you saved! Whatever your personal preference and special event, browse these dresses for under $100 to locate a figure-flattering inexpensive formal gown or semi-formal party dress in your favorite fabric and color.